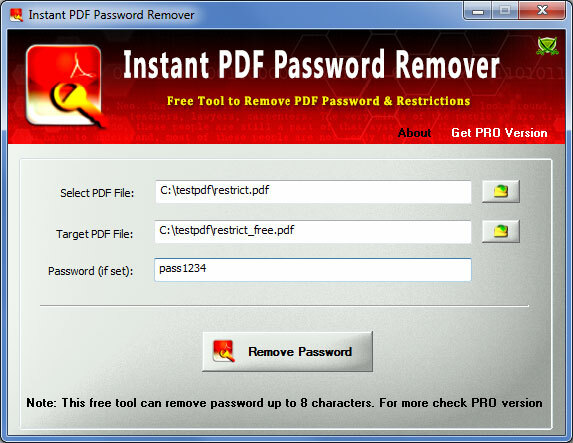 Instant PDF Password Remover is the FREE tool to instantly remove Password of any protected PDF file. It can remove both User & Owner password along with all PDF file restrictions such as Copy, Printing, Screen Reader etc. Often we receive password protected PDF documents in the form of mobile bills, bank statements or other financial reports. It is highly inconvenient to remember or type these complex and long passwords. 'Instant PDF Password Remover' helps you to quickly remove the Password from these PDF documents. Thus preventing the need to type these complex/long password every time you open such protected PDF documents. Note that it cannot help you to remove the unknown password. It will only help you to remove the KNOWN password so that you don't have to enter the password everytime while opening the PDF file. It makes it even easier with the 'Right Click Context Menu' integration. This allows you to simply right click on the PDF file and launch the tool. 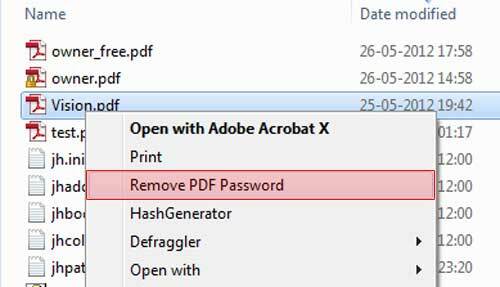 Also you can Drag & Drop PDF file directly onto the GUI window to start the password removal operation instantly. Instant PDF Password Remover can unlock any PDF file protected with all versions of Adobe Acrobat Reader using different (RC4, AES) encryption methods. It comes with Installer for quick installation/un-installation. It works on wide range of Operating systems starting from Windows XP to new Windows 10 version. A protected PDF Document may have 2 kind of Passwords. User Password & Owner Password. User Password: It is also called as Document Open Password. It is required to open the protected or secure PDF file. Generally utility bills, bank & other financial documents are protected with User Password. In such case you can just enter this 'User Password' and open the document. Some times certain sensitive documents are protected with both user & owner password. In such cases you need to enter 'Owner Password' in 'Instant PDF Password Remover' to remove the password & all other restrictions. Instant PDF Password Remover comes with Installer so that you can install it locally on your system for regular usage. It has intuitive setup wizard which guides you through series of steps in completion of installation. Instant PDF Password Remover is easy to use with its simple & attractive GUI interface. Launch Instant PDF Password Remover on your system after the installation. Select the protected PDF file either by clicking on Browse button or Dragging file from your system. Alternatively you can also right click on PDF file on your system and select 'Remove PDF Password' as shown in screenshot 2. Finally click on 'Remove Password' to remove the password of your document. On success, password free PDF file will be generated. Note: If your PDF file is protected with both User Password & Owner Password then you have to type 'Owner Password' to remove password along with all the restrictions. Screenshot 2: Right click context menu option which can help you to quickly launch 'Instant PDF Password Remover'. Major 2016 edition with improved Installer/Un-installer screen. Also fixed the context menu problem in Windows 10. Mega release with support for new Windows 10 as well as latest Adobe Acrobat Reader DC version. Also fixed the sizing problem with higher resolution computers. Major revision with latest PDF Password remover engine. Mega edition featuring new PDF password remover engine with greater success rate and much faster than earlier version. Also fixed the Context menu integration and Adobe acrobat location finder. Fixed the screen flicker problem during the password removal operation. Now automatically converts short paths to long path names during drag/drop or context menu invocation. Other changes include proper message display and highlighting password box. Instant PDF Password Remover is not a hacking or cracking tool. It can only help you to remove the Password of your own PDF file.